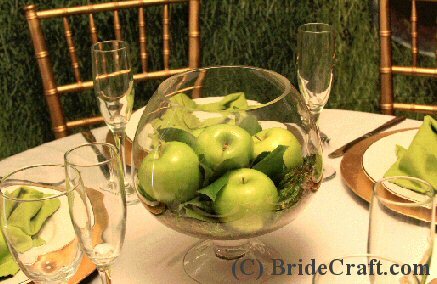 Create a Delicious Apple Centerpiece for Your Wedding! Love the idea of gorgeous fruit at your wedding? 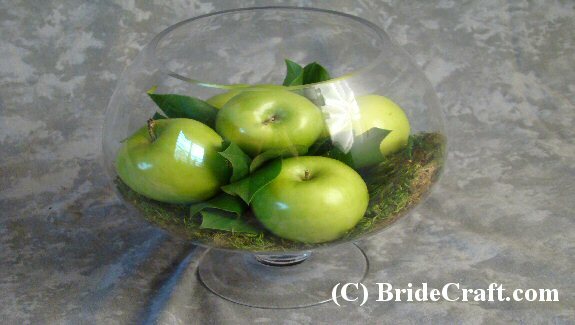 Then try your hand at this apple centerpiece! Natural and fairly inexpensive, this centerpiece may just be for you. 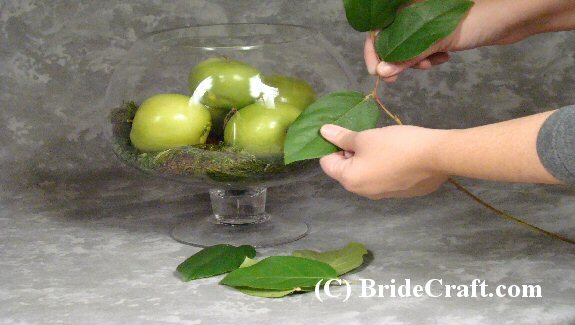 Below you will find a step by step tutorial showing you how to create this juicy centerpiece. Pros: Quick and easy to arrange, this apple showpiece is so easy it’s ridiculous! Less painstaking then flowers, these can be done a few days in advance of the wedding. Ideally suited for an outdoor wedding since the apple is less likely to spoil quickly. 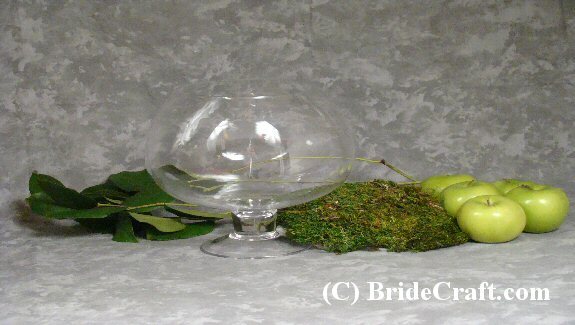 Cons: As always, transporting glass can be tricky, so keep this in mind when creating and packing your centerpieces. And apples are still a perishable item, so timing is still important so that you’re working with fresh apples and not apples that are past their time. And keep in mind, weddings are hard work! You might eat your decorations before they make it to the table. 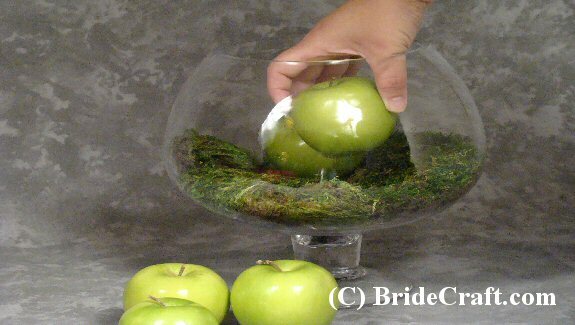 Step 1: You will need a brandy glass shaped vase (or a bubble bowl as an un-footed alternative), 5 to 7 small apples, 2 to 3 stems of Salal (a commercially harvested citrus leaf), and a medium sized piece of green dried sheet moss. 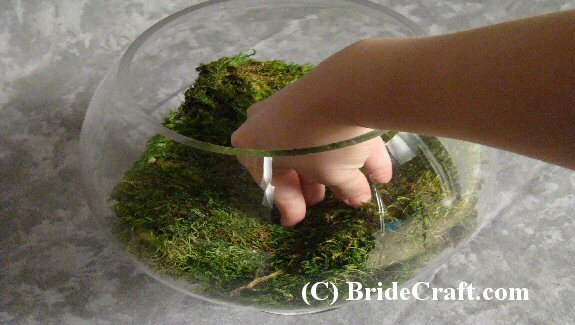 Step 2: Take your dried sheet moss and arrange it at the bottom of your vase, with the green side facing up. Step 3: Pile your apples into the vase, loosely attempting to create an pyramid effect, with at least one apple at a higher level than the others. Step 4: You should have something like this. 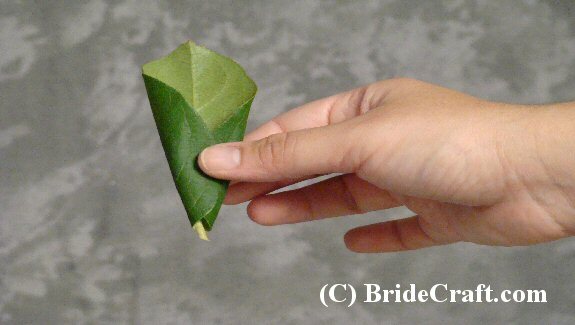 Step 5:Take your salal and carefully tug each leaf off of the stem, as shown. Step 6: Curl the individual leaf making a narrow at the base so that you can slide the curled leaves in the gaps between the apples. Tip: Use a glue dot to keep them still if you need perfection! 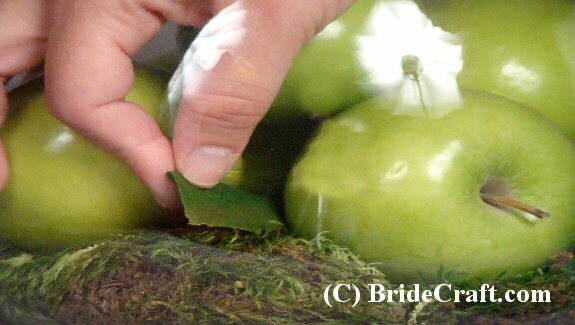 Step 7: Tuck the leaves between the apples, filling in any empty spaces and adding texture. Step 8: And your fruit centerpiece is done… Enjoy! 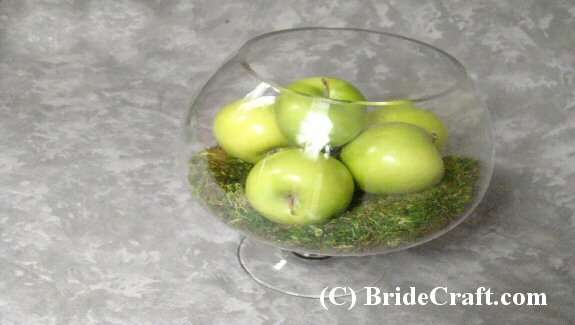 Return Apple Centerpiece to Centerpieces Page.